I'm finally back to posting as you can see. I've been really busy with a game I'm working on and other things so I haven't had time to check the blog. Anyway, let's get started on the "Mod Magic" tutorial, or as I like to call "Mod Magic", SmartFoxServer objects. This technique is very simple to learn, and I'm going to try to explain what each line does carefully enough so that a beginner can understand it, much like the SmartFoxserver Docs already does. Anyway, let's begin now. First off, I'm using the provided SmartFoxServer avatarChat example file for this tutorial, just like all my other tutorials. So, open your Flash file up and go to the frame you want to add your Mod Magic and open the actions for that frame. Now, the first line should tell you that we need to create a symbol in our Flash file. So, what I did was create a very simple rectangle shape and wrote some words on it and made it a movieclip by selecting it and converting it to a symbol by right clicking and choosing the "Convert to Symbol..." option. I gave it the instance name of "showM1", which, for me, stands for "showMagic1." The next and final thing to do is to setup the smartfox.onObjectReceived handler, which is in the coding above. So now you are able to test your movie. 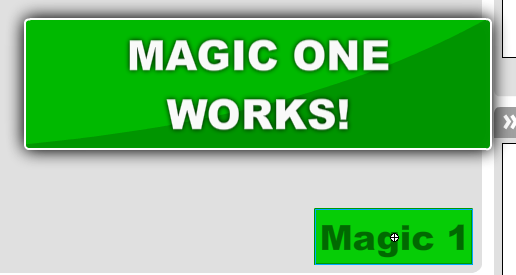 You should be able to see that when a user clicks the button, it shows your "Mod Magic." NOTE: When the smartfox.sendObject() command is called, since your user is the sender of the object, the object will not be broadcasted to you, so you have to make a code so it shows the mod magic on the sender's side as well, which is exactly what we did. If you have any questions or comments, please leave them on this post and I'll get back to you as soon as I can! What exactly does this do? Shows an object to other users? @Anonymous: This sends objects to all clients in the room, excluding yourself. It doesn't "show" anythign to anyone unless you code it to do so, which is what I did above.